TSAMTO, September 4. Second and last built «BAE Systems» destroyer «Duncan» project «Type-45» left the company «Skotstaun» and initiated the first step of sea trials off the west coast of Scotland. As reported by «BAE Systems» destroyer hold in the sea about 3 weeks to test the platform, power plant and auxiliary systems. Construction of the destroyer «Duncan», which is the latest in a series of six ships, began on 26 January 2007. Launch ceremony accomplished October 11, 2010. 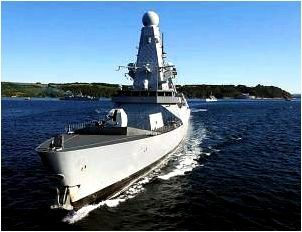 Lead ship «Daring» was handed Navy England July 23, 2009 and entered the battle fleet in June 2010. In November 2010, the Navy of England adopted a second destroyer — «Dauntless». Third ship of the series «Diamond» joined the Navy in July 2011, the fourth «Dragon» — April 20, 2012. 5th Destroyer «Difender» English fleet was transferred in April this year. «Duncan» is planned to transfer the Navy England in the first half of next year. The new ships are designed for spoofing destroyers «Type-42», taken into service, since 1978. The main objective of destroyers «Type-45» is the organization of defense and protection of the Navy task force in England and coalition forces from the massive attacks of modern and promising anti-ship missiles and enemy warplanes. Destroyers also plan to use in operations to combat piracy, assistance to victims of natural disasters, reconnaissance.